The USS LANGLEY was the first step in a new direction for the US Navy and naval warfare. CBI - China: Day 51 of 154 of the Japanese Invasion of Manchuria. Spain: Day 114 of 985 of the Spanish Civil War. CBI - China: Day 19 of 29 of the 1st Battle of Suiyuan. Spain: Day 479 of 985 of the Spanish Civil War. CBI - China: Day 124 of 2,987 of the 2nd Sino-Japanese War. Day 87 of 106 of the 2nd Battle of Shanghai. Day 68 of 70 of the Battle of Taiyuan. 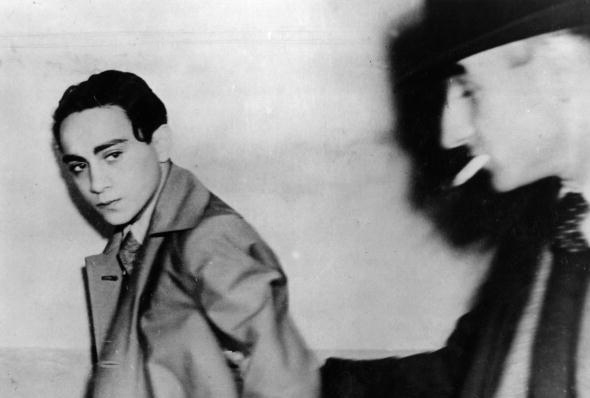 Paris: Herschel Grynszpan, 17 year old son of a family of deported Polish Jews, shoots and mortally wounds diplomat Ernst vom Rath at the German embassy. Immediately after his death two days later, the anti-Semitic violence of Kristallnacht will be launched throughout Germany. official Ernst vom Rath in Paris. A few days earlier, German authorities had expelled thousands of Jews of Polish citizenship living in Germany from the Reich. Grynszpan had received news that his parents, residents in Germany since 1911, were among them. Already living illegally in Paris himself, a desperate Grynszpan apparently sought revenge for his family's precarious circumstances by appearing at the German embassy and shooting the diplomatic official assigned to assist him. Vom Rath died on November 9, 1938, two days after the shooting. Grynszpan was sent to a concentration camp, never to be seen again. Spain: Day 844 of 985 of the Spanish Civil War. CBI - China: Day 489 of 2,987 of the 2nd Sino-Japanese War. Day 27 of 81 of Japan's Operation GUANGDONG. ETO: The Belgium and Dutch Monarchs offer to act as peace negotiators. Hitler rejects the proposal, as do both Britain and France. CBI - China: Day 854 of 2,987 of the 2nd Sino-Japanese War. 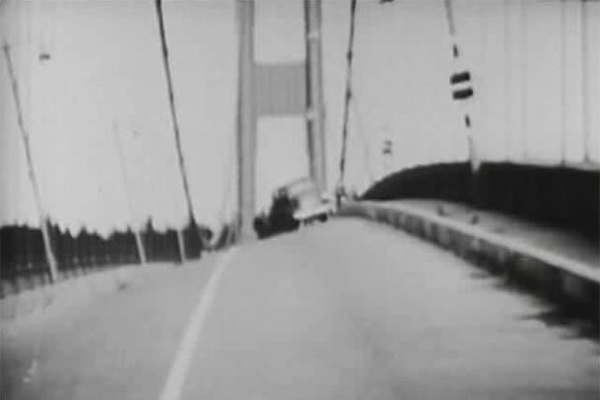 USA: The swaying deck of the Tacoma Narrows Bridge, nicknamed "Galloping Gertie," collapses into the Puget Sound in one of history's worst engineering disasters. The original Tacoma Narrows Bridge opened on 01 Jul 40, connecting the Washington state Olympic peninsula to the industrial mainland. It was the third longest suspension bridge in the world at the time and had an incredible width-to-length ratio and exceptional flexibility. It received its nickname "Galloping Gertie" because of the vertical movement of the deck observed by construction workers during windy conditions. The bridge became famous for its pitching deck. For months people came from near and far to drive across it, marveling as the car ahead would dip in and out of view. When the bridge collapsed into Puget Sound the morning of 07 Nov 40, under high wind conditions that had sent her into an increasing self-propelled rhythmic swaying, it was one of the worst disasters in engineering history, but the lessons learned from it would influence future bridge design worldwide. As design issues were being resolved, the United States' involvement in World War II postponed plans to replace the bridge for several years. The new bridge was finally opened on 14 Oct 50, and was nicknamed "Sturdy Gertie." ETO - UK: Day 63 of 258 of the Blitz. The Royal Air Force attacks the Krupp munition works in Essen, Germany. East Africa: Day 151 of 537 of Italy's East African campaign in the lands south of Egypt. CBI - China: Day 1,220 of 2,987 of the 2nd Sino-Japanese War. Day 359 of 381 of the Battle of South Guangxi. CBI - Thailand: Day 38 of 221 of the Franco-Thai War (Vichy France vs Thailand). ETO - Germany: The RAF bombs Berlin with 169 aircraft. Russian Front - Finland: Day 132 of 142 of Operation SILVER FOX, a joint German-Finnish campaign to capture the Russian port of Murmansk in the Arctic. Russian Front - Finland: Day 130 of 140 of Operation ARCTIC FOX, a joint German-Finnish campaign against Soviet Northern Front defenses at Salla, Finland. Russian Front - Finland: Day 139 of 164 of the Battle of Hanko. The Soviets will be forced off their leased naval base. Russian Front: Day 139 of 167 of Germany's Operation BARBAROSSA. Russian Front - North: Day 61 of 872 of the Siege of Leningrad. Russian Front - Center: Day 37 of 98 of the Battle of Moscow. Russian Front - South: Day 9 of 248 of the Siege of Sevastopol, Crimean Peninsula. MTO - Libya: Day 212 of 256 of the Siege of Tobruk. East Africa: Day 516 of 537 of Italy's East African campaign in the lands south of Egypt. CBI - China: Day 1,585 of 2,987 of the 2nd Sino-Japanese War. ETO - France: US 8th Air Force heavy bombers attack U-boat pens at Brest. Russian Front - North: Day 426 of 872 of the Siege of Leningrad. Russian Front - North: Day 187 of 658 of the Siege of the Kholm Pocket, USSR lays siege to the Kholm Pocket but the Germans hold out for a about a year and a half. Russian Front - South: Day 133 of 150 of Germany's CASE BLUE, the failed offensive to take the Caucasus oil fields. Russian Front - South: Day 77 of 165 of the Battle of Stalingrad, bloodiest battle in human history. MTO - Egypt: Day 16 of 20 of the 2nd Battle of El Alamein. CBI - China: Day 1,950 of 2,987 of the 2nd Sino-Japanese War. PTO - Alaska: Day 154 of 435 of the Battle of Kiska, Aleutian Islands. The US and Canada will defeat the Japanese invaders. PTO - Malaya: Day 262 of 357 of the Battle of Timor Island, a long guerrilla war ending in Japanese victory. PTO - New Guinea: Day 110 of 119 of the Battle of the Kokoda Track. The Australians continue pushing back the Japanese troops. PTO - Solomon Islands: Day 93 of 187 of the Battle of Guadalcanal. Russian Front - North: Day 791 of 872 of the Siege of Leningrad. Russian Front - North: Day 552 of 658 of the Siege of the Kholm Pocket. USSR lays siege to the Kholm Pocket but the Germans hold out for a about a year and a half. Russian Front - South: Day 76 of 122 of the Battle of the Lower Dnieper River, USSR. Russian Front - South: Day 5 of 10 of the 2nd Battle of Kiev, Ukraine. MTO - Italy: US 12th and 15th Air Forces provides air support for the Allied ground troops. CBI - China: Day 2,315 of 2,987 of the 2nd Sino-Japanese War. Day 6 of 49 of the Battle of West Changde. PTO - New Guinea: Day 50 of 219 of the Battle of Shaggy Ridge. PTO - New Guinea: Day 47 of 162 of the Battle of the Huon Peninsula. PTO - New Guinea: Day 6 of 10 of the Bombing of Rabaul, a joint US, Australian and New Zealand carrier and land-based attack on the Japanese cruiser force at the naval base at New Britain. PTO - Solomon Islands: Day 7 of 295 of the Battle of the Bougainville Islands. USA: Franklin D Roosevelt is re-elected president for a fourth term with Harry S Truman as vice-president. Within six months, FDR will be dead and Truman will be president. 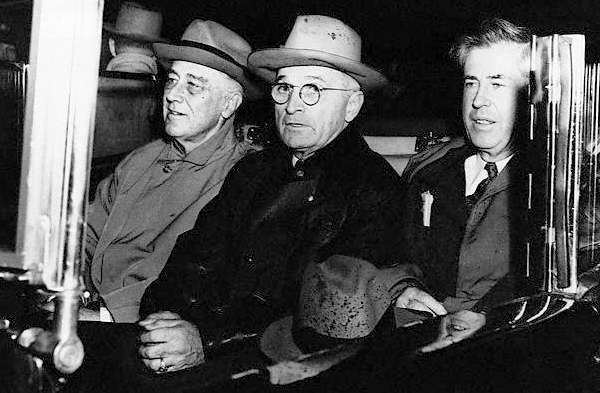 10 Nov 44: President Franklin D Roosevelt, Vice President elect Harry S Truman, and current Vice President Henry A Wallace. ETO - France: Day 99 of 284 of the Battle of Brittany. ETO - Belgium: Day 37 of 38 of the Battle of the Scheldt Estuary. ETO - France: Day 54 of 236 of the Siege of Dunkirk. ETO - Germany: Day 50 of 145 of the Battle of Hürtgen Forest. Russian Front - Finland: Day 54 of 223 of the Lapland War. Finland and Russia have joined forces to kick the Germans out of Finland's most northern province. Russian Front - Center: Day 24 of 206 of the Battle of the Courland Pocket in Latvia. Russian Front - Center: Day 17 of 99 of the Siege of Memel, a border town of Lithuania and East Prussia. Russian Front - Center: Day 55 of 72 of the Battle into East Prussia and northern Poland. Russian Front - South: Day 10 of 108 of the Battle of Budapest, Hungary. Russian Front - South: Day 55 of 72 of the Battle of Belgrade, Yugoslavia. MTO: US 15th Air Force B-17s and B-24s attack targets in Yugoslavia, Italy, and Austria. CBI - Burma: Day 221 of 302 of the Chinese Salween Offensive in Burma. CBI - China: Day 2,681 of 2,987 of the 2nd Sino-Japanese War. Day 205 of 259 of Japan's Operation ICHI-GO. PTO - New Guinea: Day 316 of 597 of the Battle of New Britain. PTO - New Guinea: Day 200 of 481 of the Battle of Western New Guinea. PTO - Palau Islands: Day 54 of 74 of the Battle of Peleliu (Operation STALEMATE II). PTO - Philippines: Day 19 of 299 of the 2nd Battle of the Philippines, aka the Liberation of the Philippines or the Philippines Campaign. PTO - Philippines: Day 19 of 73 of the Battle of Leyte. The violent attacks unleashed by the Nazis against the Jews that took place throughout Germany came to be known as Kristallnacht, the "Night of Broken Glass." The brutal assault came to an end, but it marked the beginning of something much worse: the Holocaust. Behind every great engineering success is a trail of often ignored (but frequently spectacular) engineering failures.